Get your wallets out. Valve's annual Steam Summer Sale is here, and with it comes a deluge of ridiculous sales on excellent games. But the wilderness of wonderful discounts can be tough to navigate. Don't worry: we're here to help. 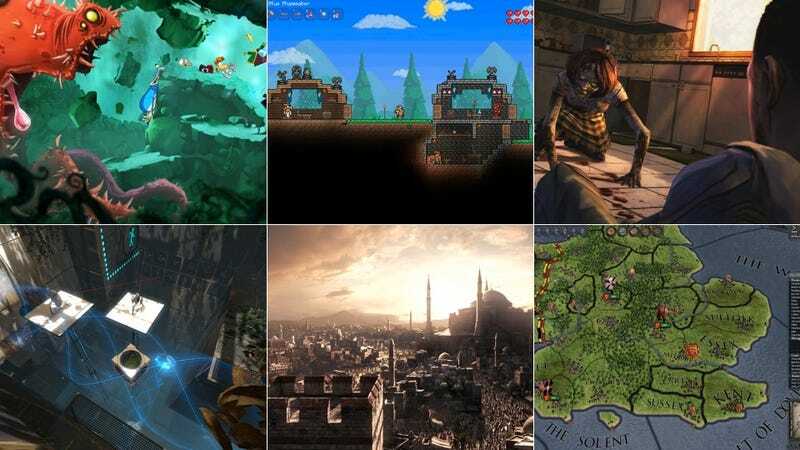 The staff of Kotaku has put together a list of 10 games you should totally buy. Our recommendations are based on both game quality and relative discount. Please keep in mind that due to the nature of the sale, many of these prices will fluctuate over the next few days. Check out the timer on each Steam listing to see how much longer each sale will last. Portal 2 [$5] - Not only is Valve's first-person puzzler both brilliant and hilarious, it will legitimately make you feel smarter as you play. For $5! Rayman Origins [$15] - A colorful, bouncy platformer that relives the good old days of golden age platforming. Deus Ex: Human Revolution [$7.50] - Ridiculously great price for the third Deus Ex, a game that is a sheer joy to experience (at least until its ending sequence, which is kind of a drag). This sale only lasts a few more hours. SpaceChem [$2.50] - An indie puzzle game based on chemistry that Stephen says is much more fun than it sounds. Civilization V [$15] - Fantastic price for a strategy game that will keep you up until 5am every night for the rest of your life. Terraria [$2.50] - Minecraft meets Metroid in this top-notch indie hit. The Walking Dead [$18.74] - Kirk and Tina are nuts over this episodic adventure game. Only two out of five episodes are out so far, but with this package, you'll get them all as they're released. Crusader Kings II [$10] - One of Luke's favorite strategy games and, when modded, the best Game of Thrones video game out there. Legend of Grimrock [$6] - An addictive first-person dungeon crawler reminiscent of old-school games like Stonekeep. Remember, the whole sale ends on July 22. Enjoy!